You are wrong, Cakebread. His hands are not at his throat, they never went near his throat. The Altgens photo shows only his left hand, index finger extended, other fingers curled, and the hand is in front of his chin. His right hand-- by the time this picture was taken--is open and in front of his chest and continues to move downward onto his chest. 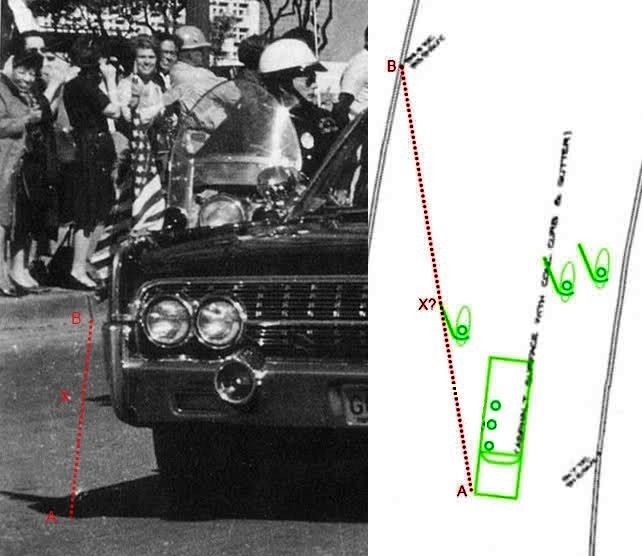 You're right about a picture being netter than a thousand words, though, because this picture along with the Zapruder film proves that you haven't a clue as to what President Kennedy's hands did when he was shot! So JFK is reacting to being hit in the photo....But Connolly is NOT......And James Chaney is also reacting to JFK being hit.... He is alongside of the Lincoln and looking over his right shoulder at JFK. Walt - The "hands" issue is a diversion. You got 'em on the run with the Officer Chaney position issue. As much as they might like, don't take their detour. It's C-o-n-n-A-l-l-y, Walt! Not "Connolly". You can't even spell the name of the governor corectly! The position of JFK's hands ARE in fact, crucial, because we have people like you and others making erroneous claims that his hands "clutched/grabbed/went to" his throat when they didn't! As far as your ridiculous claims about Chaney...have at it. You are making yourself look even more foolish. And you can't even spell correctly, correctly. Now it's "lens distortion"...... Ha,ha,ha, LOL!! So sad. You are too stupid to even understand how a camera records an image. Take the standard railroad tracks image. The tracks are the same distance apart. Yet as the recede towards the distance the appear toget close set together. The exact same things happpen to shadows. It’s photo 101 and you fail. The shadows don’t lie, you just can’t hear them telling you that you got it wrong. As usual. Hi Walt. Did you notice the X marking the tip of the motorcycle shadow? (I added a question mark on the diagram to the right because of the uncertainties involved.) Where on the diagram would you place the X? You seem to think it's much closer to the front bumper shadow (A) than it is to the curb (B) in the background, but does it really seem so when you look at the photo?